After we left Bangkok, Alex and I headed up to Chiang Mai. We had booked a two week stay at the Elephant Nature Park 38 km north of Chiang Mai, with the Elephant Nature Park office located in downtown Chiang Mai. The city office is a no-questions-asked drop off point for animals of all species and sizes, and we were greeted accordingly by by six dogs, a chicken, four (caged) kittens and a number of friendly staff members eager to get us checked in. We were offered tea or coffee and muffins to start our day, although Alex and I had already eaten breakfast at the guesthouse. The other volunteers were as friendly and enthusiastic as we were, and we seemed to be off to a great start. We were driven an hour and a half north to the park, where we were introduced to our volunteer coordinators and the other inhabitants of the park. There are 37 Asian Elephants, 70-odd dogs, 40-some cats, two horses, a herd of Asian Buffalo and one Chinese Moon Bear living at the park. The 37 elephants at the Park come from a broad spectrum of backgrounds; some were used as logging elephants, others as trekking or show elephants, and others were rescued from a life of begging on the streets or scavenging near highways. Many come crippled from car accidents, logging accidents or forced breeding programs, and the park provides an asylum for all of these troubled animals. The park is relatively free range during the day for the elephants, who are accompanied by their mahouts, and at night they are given more food in their shelters. 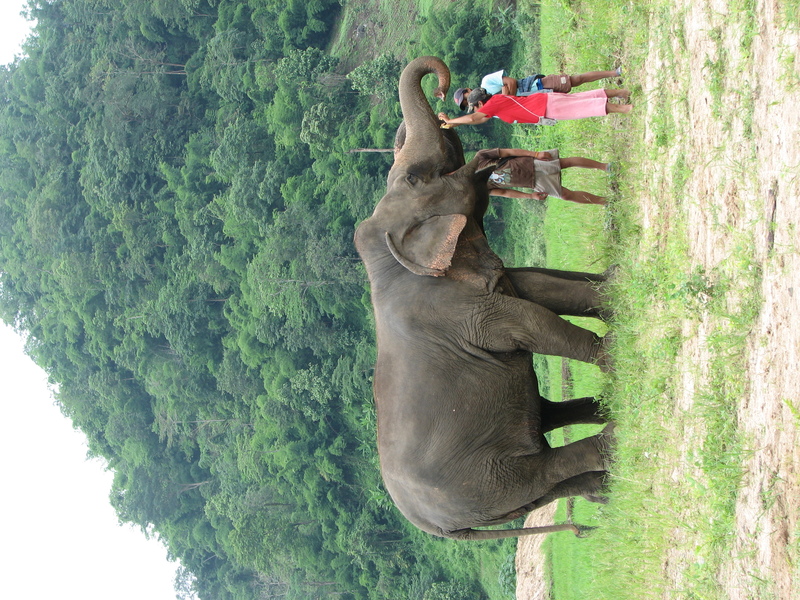 Elephant being fed by his mahout at the Park. In the first few hours we were educated about the work that the E.N.P does for its animals and the local community. All of the food served to the elephants (and the people) is organic and locally sourced, and the park employs and houses Burmese refugees and their families as mahouts for the elephants. The park also employs women from nearby villages as masseuses, and every Monday the village elders and a shaman come to the park to greet and bless the new visitors. The Elephant Nature Park is also one of the premier organizations that is trying to ban a training technique called the Pajaan or the “crush,” which is designed to break the will of young elephants by putting them into small cages and hitting them with nails affixed to sticks or elephant hooks. So far they have managed to eliminate the use of elephants in city street begging in Chiang Mai andBangkok, and are working to make it illegal in the rest of Thailand as well. The Park also sponsors mass vaccinations of animals in the surrounding villages, and offers mobile veterinary clinics which make their way from town to town to offer aid as needed. On the first day our guides Dino and James took us around the park and led our orientation. 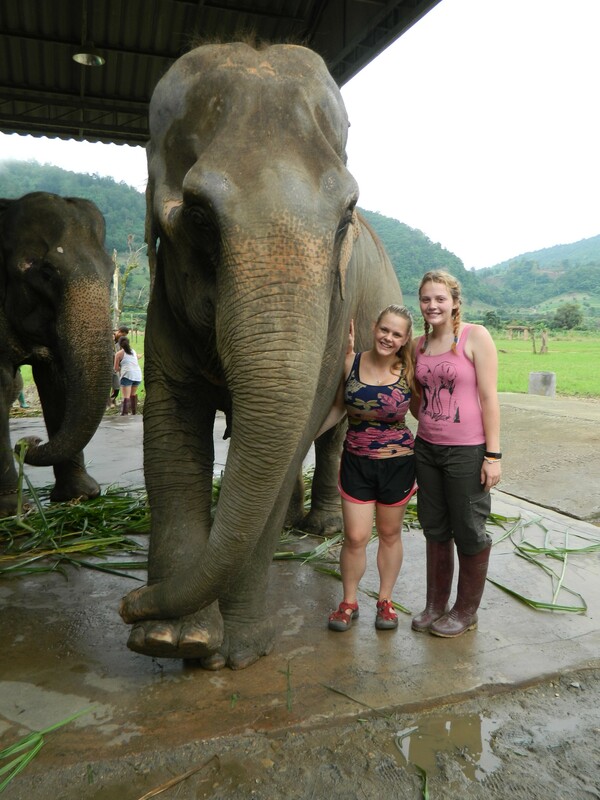 We started our tour by feeding the elephants before settling down for a delicious buffet-style lunch. The tastiest options run out very quickly, and we quickly learn that we have to get to meals as early as possible in order to get the most delicious foods. After lunch we had some free time to socialize and bathe the elephants before we went to watch an informative film about Lek, her vision for the park and the obstacles that she had to overcome in order to get her project started. We also learned about the horrible abuse elephants suffer while being trained to be submissive, and how this is most often hidden from the general public. 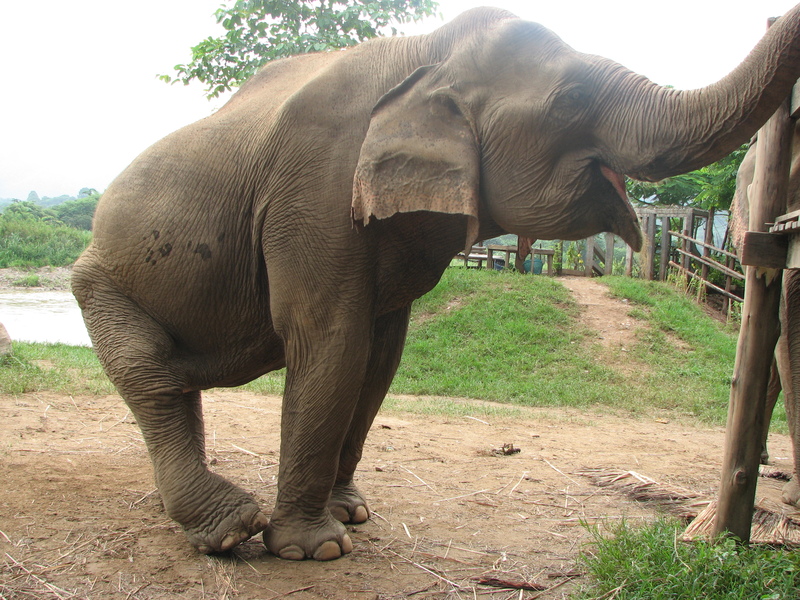 A female elephant whose hips were broken in a forced breeding program. Over the next week, our days were divided into a series of activities. In the mornings we ate breakfast from seven to eight, and then at eight began our first chores. 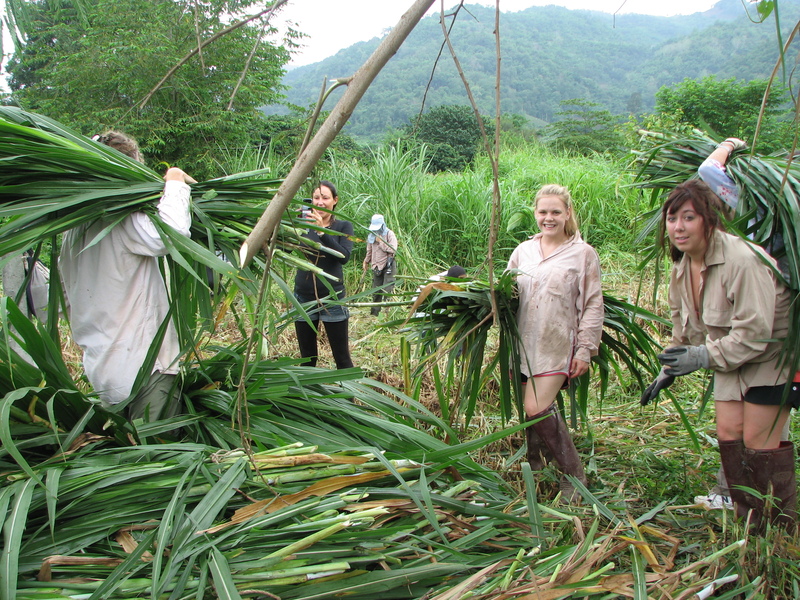 We were divided into three groups, and activities included elephant food preparation, shoveling poop, cutting grass and corn for the elephants, collecting wood, shoveling sand and fixing fences. Other times we had fun activities like tubing, playing with kindergarteners at the local school, tying blessed scarves onto trees to prevent them from being forested, and getting to spend some time with the elephants around mealtime. We were given a more extensive tour of the park, and often had time to play with the numerous dogs. Playing with kids at the kindergarten in the village school. In the evenings we had some free time to socialize or had a programmed activity. These activities included a Thai language lesson, a ritual with a shaman, and the broadcasting of various informative films, but for the most part we were allowed to kick back, relax, have a few drinks and get a massage. Lek, the owner of the park, has also given aid to several other projects. 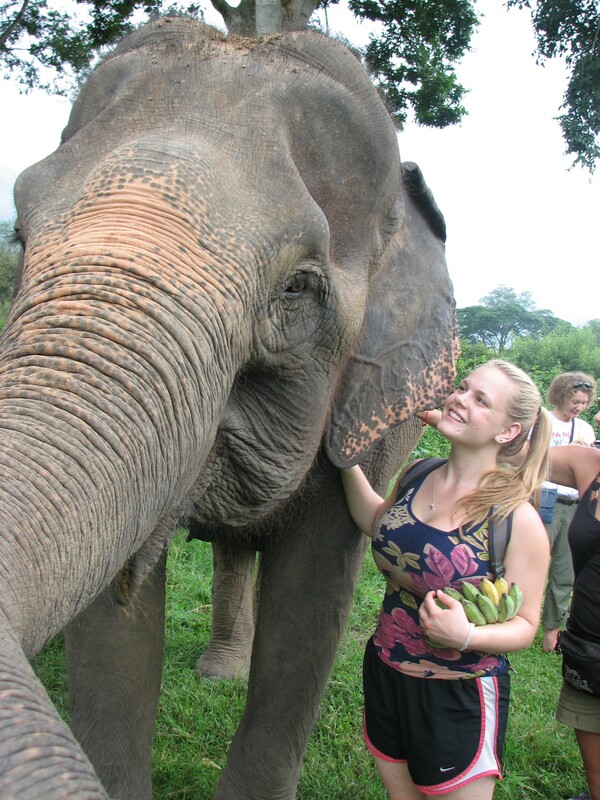 The one that Alex and I have decided to go on for the second week of our trip is called Journey to Freedom, and it is a program that helps bring elephants from the trekking camps back to live in their native villages or at theElephantNaturePark. We will be living with villagers in their homes in exchange for doing farm work and other odd jobs for our host families and their villages. Overall I would highly recommend theElephantNatureParkto almost any and every one. The park benefits massively from the influx of volunteers and day visitors, and I cannot think of a more honest, good-hearted foundation. The location is beautiful and the message that the park sends is simple and wonderful in that simplicity. It is more than worth a visit, and I cannot wait to go back. Hi It’s Mrs. S. Looks like you are having a great time. Thanks for photos and postings. I want to go to Thailand now!